Astrophotographer Yuichi Takasaka tweeted this photo of a fireball over Vee Lake, Yellowknife, NWT, Canada, on March 5, 2014. 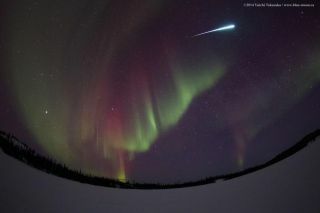 A blindingly-bright fireball blazed across an aurora-filled sky over remote Canada's Northwest Territories in these spectacular images by astrophotographer Yuichi Takasaka of the photography group The World at Night (TWAN). "One of the brightest fireball I've seen tonight!" Takasaka (@ytakasaka) tweeted on March 5. "A few minutes later, we could hear the huge explosion sound from the direction of the fireball fell. I am not sure the sound was created by sonic boom or something else." The photographer didn't adjust anything with images from the RAW file to jpg. They were only resized down to 1200 x 800. "What an exciting night," Takasaka said. Astrophotographer Yuichi Takasaka tweeted this photo of a fireball over Vee Lake, Yellowknife, NWT, Canada, on March 5, 2014. The top photo shows the brightness of a car's high-beam headlights which passed by 5 minutes earlier.